Set out on a journey through an unknown land full of secrets and mystical mechanisms in the exciting casual fantasy strategy game Gnomes Garden 2. A multitude of varied quests, over 40 levels, an upbeat plot, simple and entertaining gameplay and an extraordinary universe – all this is waiting for you right now. 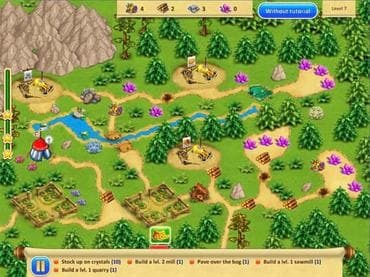 Restore ancient machines, plant magical gardens, manage resources and construct buildings. Simple controls and a clear tutorial will help you master the basics of the game. And don’t forget to use the princess’s powerful magic to get you out of tough spots. Gnomes Garden 2 – defeat the queen of trolls and bring magic back! If you have questions about Gnomes Garden 2 game, please contact us using this form.